The affidavit of support forms are documents that assure the declaration of support made in the form is legally enforceable. These forms can be many and varied – there are Affidavit Forms for sponsoring students, forms for marriage, forms requesting child support and so on. These are mostly required by the lawyers and notary, courts, immigration departments but sometimes the educational institutions too would need such forms while admitting sponsored students. There is a pre-designed affidavit of support form samples online for your convenience. 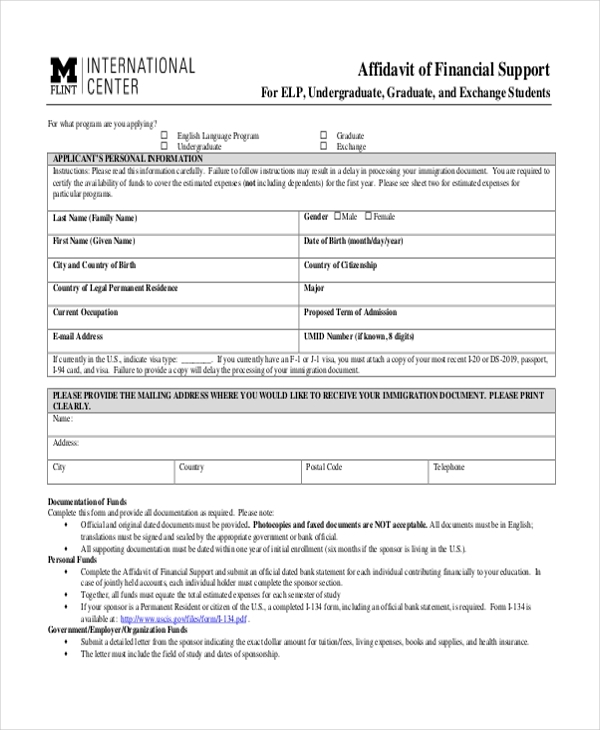 If you are looking for affidavit of support forms for people willing to sponsor the education of a student abroad, this is the form for you. The form enables the sponsor to declare whom he wishes to sponsor for education in your university. It also mentions the amount of money he is willing to sponsor. This general affidavit form would be helpful for immigration and naturalization departments. The form comes with all major relevant sections including information of the candidate’s birth, his duration of stay in the US, data of the person on behalf of whom the affidavit is being executed, the candidate’s income, oath or affirmation of the sponsor etc. 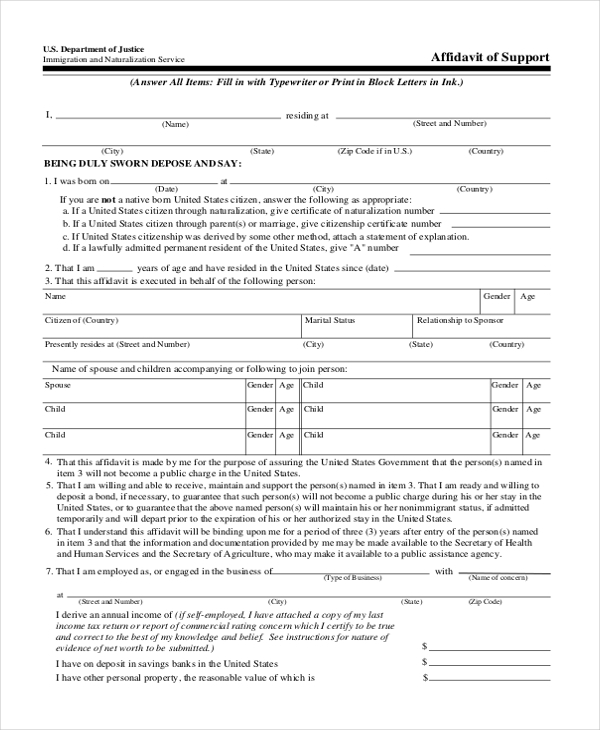 This affidavit of support form would be required by the passport departments when it needs consent from the parent while a minor is about to apply for a passport. The form is to be filled up by the parent where she/he will confirm that she/he is offering full concern and authority for the child’s application for passport and travel. The affidavit of support form here would be needed by embassy consular sections. It is to be filled by a national citizen who declares that he wishes to invite a citizen of another country to his state for vacation and that he has provided round trip ticket to his guest as well as willing to take full responsibility of the guest. 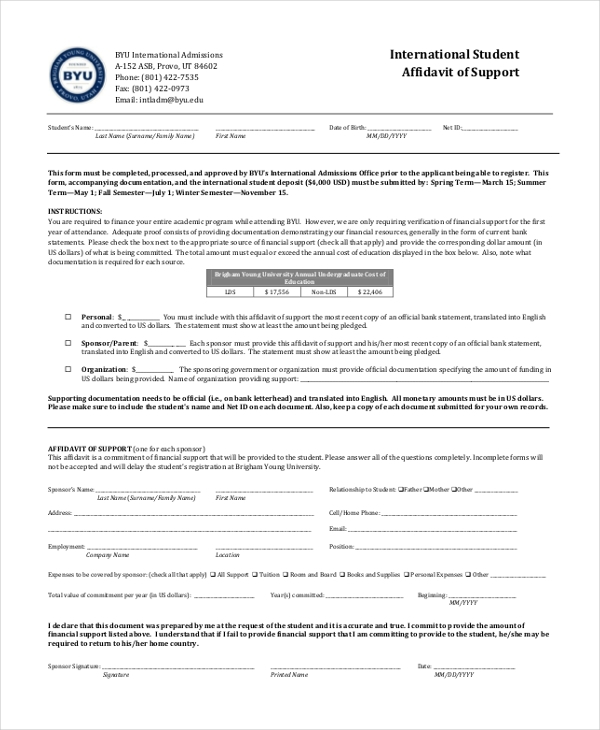 If your university needs an affidavit of support forms featuring more than one sponsor, then this form would be handy for you. It begins with basic information on the applicant, mailing address to receive immigration document, documentation of funds, expense sheet etc. Then, you have sections for two sponsors followed by a declaration by the applicant. 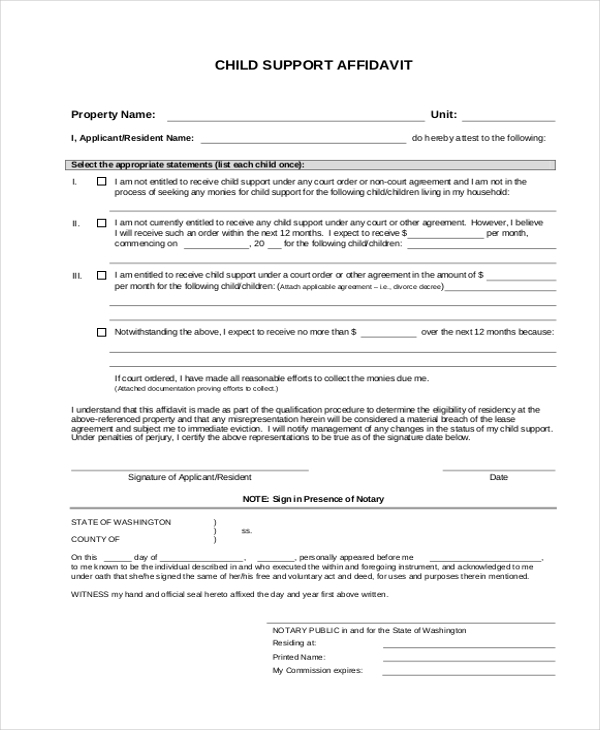 The form here would be useful for notary public who would have to authorize an affidavit of child support as required by a resident parent in the US. The form is to be filled by the parent with information on the child/children for whom he or she is requesting the child support. The form also contains information about the amount of child support being requested. The affidavit form here would be useful for your university when you are admitting sponsored students from abroad in your organization. The form will contain data on the amount being pledged as well as the needed information about the sponsor- such as his basic identity, employment data, relationship with a student, total value committed etc. 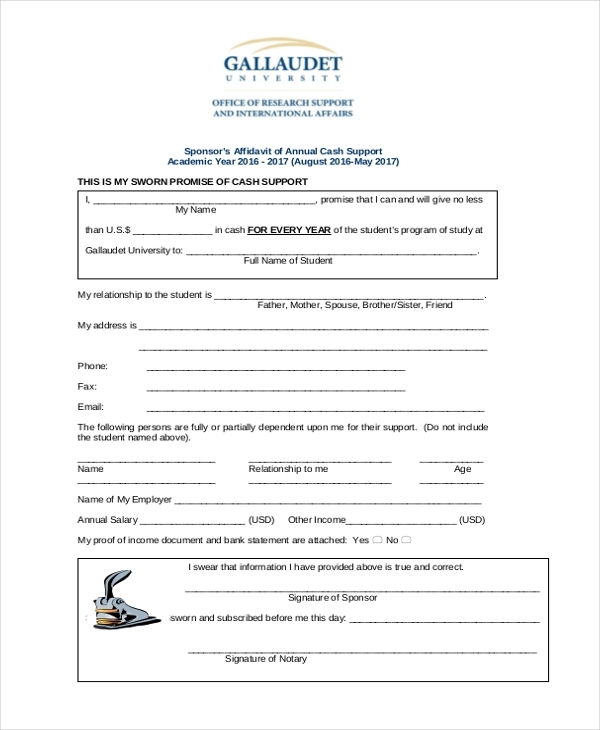 If your institution accepts sponsorships for students, then this form would be a handy tool for you to attain the declaration of sponsorship from the sponsor, it begins with pointers on significance of this affidavit, followed by tips on filling the form by sponsor and also data on what document of proof would be needed for the form. 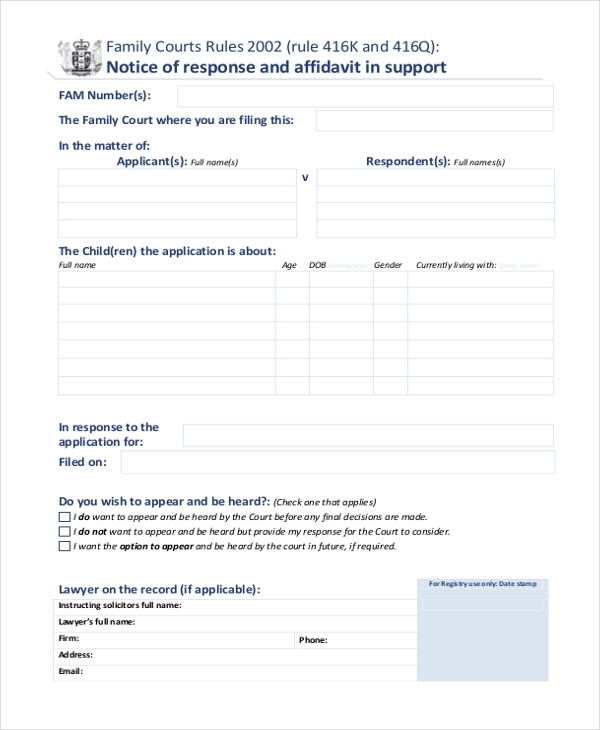 This family court affidavit of support form is to be filled by an individual who has to respond to an application being sent to him regarding child care by the family court. Along with the form itself, the sample also contains information regarding how the person would respond to the form. This affidavit form is in support of a request for a decision by default. It begins with general instructions on filling the form followed by the form itself. The form is to be filled by both the applicant who is claiming that the respondent has not offered the help committed to full as well as the solicitor. 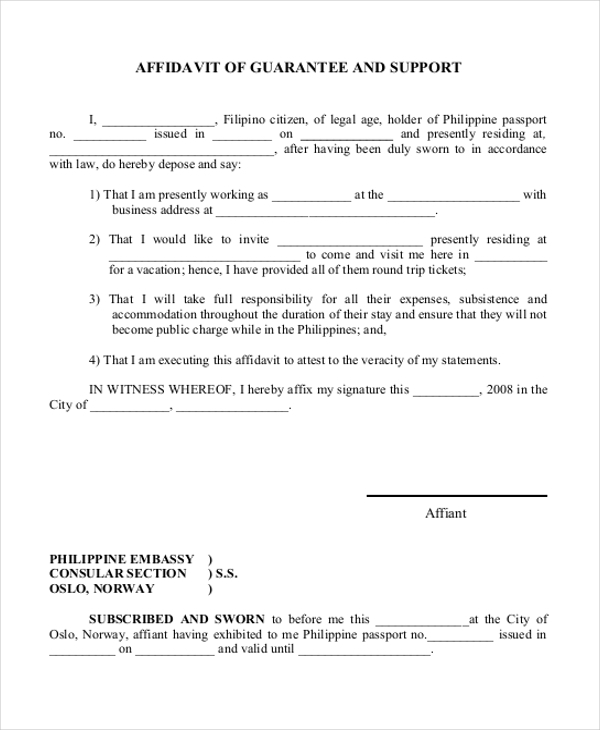 What is The Purpose of an Affidavit of Support Forms? The main purpose of an affidavit of support forms is to ensure that the declaration made is legally enforceable and such forms are generally signed by a notary. It could be a husband declaring his marriage to his wife through an affidavit form for marriage. It could also be a sponsor certifying that he is willing to commit a certain amount of money to a student for his further education in a certain university or college. Another major purpose of such forms is to make sure that the sponsor promising the sponsorship does not skip out on his commitment as otherwise, the sponsored individual will have all the rights to sue him. You may also see General Affidavit Forms. 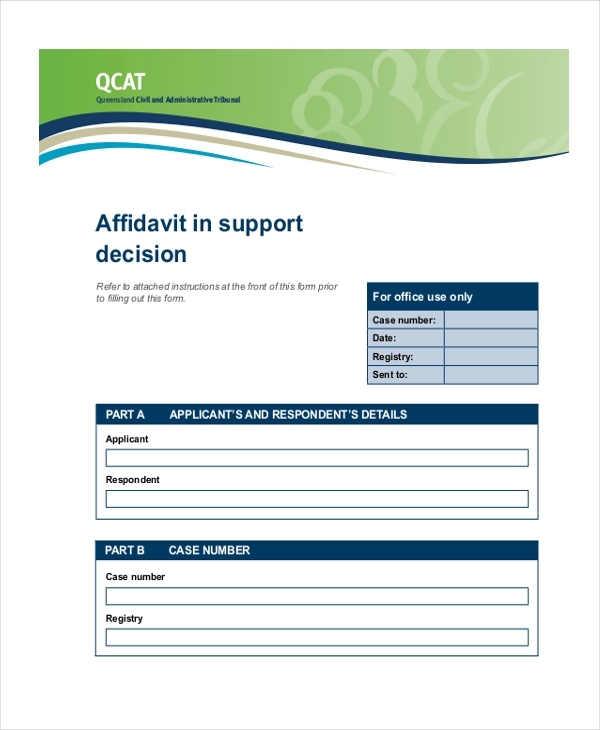 Who Needs an Affidavit of Support Forms? The affidavit of support forms is largely required by the notary or the solicitors as they are the ones who authorize these legally enforceable forms. It could be an affidavit form for marriage or an affidavit form requesting child support from the government. Besides, academic institutions admitting sponsored students would also require these affidavits of support forms to gather information and commitment of help from the sponsor/s. Moreover, these forms are a handy tool for passport offices as well as government immigration and naturalization departments. Then, the embassy consular sections of the government would need the affidavit of support forms too. What is Covered by Affidavit of Support Forms? The affidavit of support forms generally involves a declaration from the sponsor that he is willing to sponsor an individual for a certain program at a certain organization. Such as further education in a foreign university. These forms contain basic information about both the sponsor and the sponsored as well as the amount the sponsor has committed to. Then, if it’s a form of marriage, the marriage date, and the name of the spouse should be mentioned. If it’s a form of consent, the purpose of the consent, as well as data of the parties involved in it, have to be noted. You can also see Affidavit of Service Forms. If you are looking for ideas on how to draft affidavit of support forms, the samples mentioned above would be of amazing help to you. There are forms for universities, notary, family courts, lawyers and what not! All are drafted by experts and hence you can be sure of standard forms only.